Under Birge’s plan, unarmed men were to board the passenger steamer United States in Oswego on November 9 as it set sail for Ogdensburg, the American town directly across the river from the attack target, Prescott, Upper Canada. Other men would board the steamer at each town as it followed its scheduled route. With his orders given, General Birge departed for Ogdensburg ahead of the steamer to organize more men. On November 10, two schooners, the Charlotte of Oswego and Charlotte of Toronto, departed from Oswego, New York. Carrying Hunter troops under the command of Colonel Nils von Schoultz, they headed towards the Thousand Islands. Their cargoes included six cannon ranging from a puny 3-pounder to a lethal 18-pounder. Their holds and decks were crammed with crates of modern rifles, including some of the recently-invented multiple-round rifles, plus ammunition, food, medical supplies, and other kit of war. Aside. All historical accounts I have read that were written since the late 19th century, except one, say Bill Johnston captained one of the two schooners. That is fiction. None of the many eye-witness accounts place him on either schooner. This misfact probably began as anti-Johnston propaganda in Canada and was passed on by generations of historians as truth. Delayed for two days by boiler repairs, the United States readied to depart the morning of Sunday, November 11. As the captain, James Van Cleve, 30, prepared to cast off, a long column of passengers in civilian clothes—-mostly young men with no baggage-—boarded the ship. Senior Hunter officers Martin Woodruff, Dorephus Abbey, and Daniel George milled among the new passengers. No fool, Captain Van Cleve suspected the newcomers were Patriots or Hunters. He refused to leave port. One of the ship’s owners, on board and bound for Ogdensburg, overruled him. At midday, the United States stopped in Sackets Harbor. Waiting to board was Captain Daniel Heustis and a small band of men. 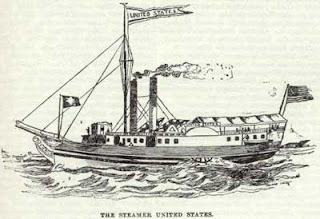 A week earlier, Sackets Harbor teemed with 500 eager Hunter recruits, but their ardor for war cooled as they waited for repairs to the steamer. Most returned home. The United States sailed up to Cape Vincent where a few more Hunters boarded. Further east, at Millens Bay, the two Hunter schooners lay at anchor. Daniel George, pretending to be a businessman, paid Captain Cleve $100 to tow the schooners. With a schooner lashed on each side, the United States continue downstream. After a brief stop at Clayton, the true nature of the schooners became apparent. On the Charlotte of Toronto, von Schoultz emerged with a sword scabbard visible beneath his long cloak. Hundreds of other men flooded the decks on both schooners. They pried open the crates lashed to the decks and armed themselves with rifles. The Hunter army sailing to Prescott now numbered 400. Captain van Cleve was no longer in control of his ship. Von Schoultz conferred with the other officers. General Birge had ordered the fleet to stop at Ogdensburg to pick up more recruits. Von Schoultz wanted to sail straight to Prescott, believing that men would desert at Ogdensburg. The other officers agreed and appointed von Schoultz their commander in chief. That evening, as the United States approached Morristown, New York, von Schoultz ordered all Hunters to board the schooners. Half failed to follow his order. Von Schoultz left Colonel Abbey in charge of the deserters on the steamer, hoping he’d change their minds. With his diminished force, von Schoultz sailed into the dark night. At Morristown, Captain van Cleve told authorities about being hijacked by Hunters, and continued to Ogdensburg, reaching there about 3 a.m., November 12. Minutes earlier, the ship’s passengers heard a rapid series of musket shots coming from across the river at Prescott.